While smartphones are useful tools for communication, navigation, shopping and practically anything else you can imagine, they are perhaps most commonly used as entertainment hubs. Whether you are waiting in the airport or just killing some time at home, games and puzzle apps present a fun way to use your Android device. Here are 4 fantastic games designed for Android. At first glance a world made of goo sounds kind of messy. But an independently developed game, World of Goo is actually based on physics principles to build five sections of fun puzzles. 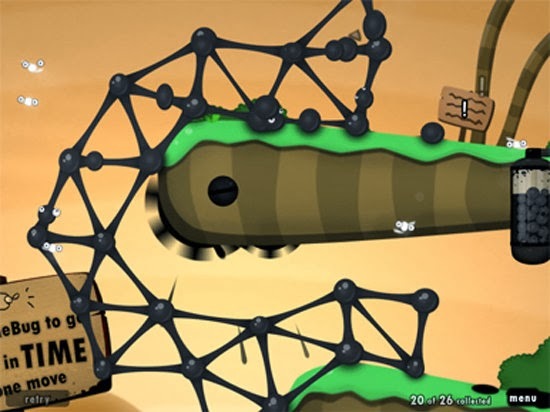 Using “goo balls,” players will work to construct bridges, towers and other structures to help defeat gravity and other obstacles such as chasms, hills, spikes, cliffs, windmills, etc. These structures will enable them to reach the exist pipe which leads to the next level. The World of Goo is a surprisingly complex place with multiple levels in each chapter all containing their own graphic theme and unique music. Unlike other games which might be created by a mobile app development company, World of Goo hails from friends Kyle Gabler and Ron Carmel who founded 2D Boy, an independent game development project. Their success with World of Goo has led to its nomination for the Seumas McNally grand prize, the Design Innovation Award and the Technical Excellence prize at the Independent Games Festival. Originally released in 1980, long before the smartphone, Pac-Man has seen several recent updates to bring it back from its arcade days. Many who grew up chasing pellets and running from ghosts will love Pac-Man for Android which closely resembles the original arcade version with a few new twists for extra adventure. Pac-Man Championship Edition for Android adds new content such as championship mazes, mission mazes and challenge mazes. Completing a maze will enable a player to unlock a new one. And in addition to the original, extra puzzles are added to create the possibility of new bonuses for eating up additional pellets. What began as a popular game is now an entire franchise as Rovio continues to release new editions of Angry Birds. Since the original’s release in 2009, millions of copies of the game have been sold in various app stores. Part of the success of Angry Birds has stemmed from its consistent adaptation. Holiday themes, new levels, updates and more keep coming to keep players hooked. One of the most recent releases is Angry Birds Star Wars 2 which capitalizes on the success of the first Angry Birds Star Wars edition that combines the game with beloved characters and story from the Star Wars movies. Sprinkle is a fun game which asks players to save the inhabitants of the planet Titan by aiming water at burning fires threatening their thatch homes. Obstacles will block the path of the water cannon and a limited supply of H2O asks players to spray carefully. Sprinkle won the Best Casual Game in 2012 from the International Mobile Gaming Awards, and it has been celebrated for providing some of the most realistic water physics created for a mobile device. With a total of 72 levels, this game will keep you busy solving puzzles and putting out fires for a long time.